"The next thing I heard was pop, a gun shot," he said. And when he saw Katie, her lifeless body was on the ground in the family yard. Doug says a utility worker at the house next door told him it was in self-defense. "(He said) 'Well your dog lunged at me, I felt threatened.' At a dog not on property?" Eiben said. "You got a 2-foot radius for the dog before it reaches the invisible fence line and the dog knows its boundaries." The Kittitas County Sheriff’s Office says Shannon Cernick was walking her dog about 8 p.m. when they came across a cougar on the trail. The dog was not on a leash and the two animals started fighting. The sheriff’s office said Cernick ran to get help. She returned with a neighbor’s friend who shot a gun at the cougar and it ran off. The 66-year-old owner told investigators that he believed he hit at least one of the three robbers before they left the store. Investigators said one man showed up at a hospital with a multiple gunshot wounds, and another man was discovered dead at a residence in the 15600 block of Rosehearty Lane near Coppergrove, west of the robbery scene. "The son apparently cut his dad with a katana. He said it was a 4' katana. The dad was sitting out here. When the dad was going into the ambulance, we heard him say, 'I'm just trying to see if my son's OK. I shot him twice,'" neighbor Javontae Tinson said. HOUSTON - A suspected robber was shot in Third Ward Tuesday by a Wingstop employee, police said. Houston Police have arrested and charged Benjamin Maurice Colbert with robbery threat, suspected of robbing the restaurant in the 3700 block of Scott Street just after 11p.m. President Donald Trump may yet rejuvenate coal mining or bring manufacturing jobs back to the United States. But his election already seems to have been detrimental to at least one economic sector: the gun industry. With the new president firmly aligned with gun-rights advocates, the FBI performed 9 percent fewer firearms background checks in the first half of this year compared to January through June 2016, according to newly released data. In Georgia, the decrease was even greater. From January to June, the FBI performed about 269,000 background checks in Georgia – 11 percent fewer than the 302,000 it logged in the first half of 2016. 2016 was the highest year for background checks conducted by the FBI NICS (National Instant background Check System) ever. 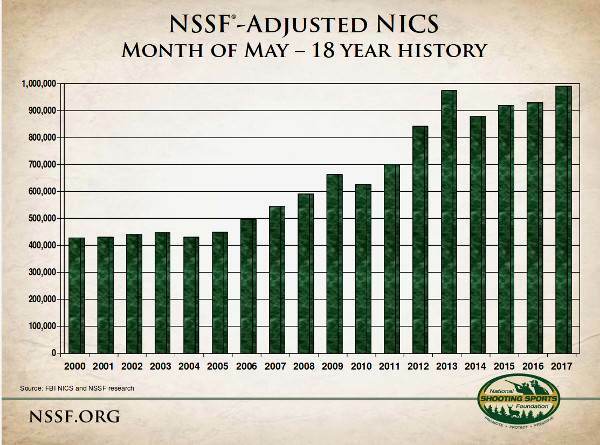 2017 looks to be the second highest number of NICS ever. Through June, 2017, there were 12,601,102 NiCS checks. That is a little lower than 2016 for the same period. 2016 set records because of fears of Hillary Clinton being elected and passing legislation making it hard to buy and own guns. In 2016, the first six months had 13,829,491 background checks. That was the all time record for the first half of a year. 2013 held the next highest number of background checks, when gun buyers feared that President Obama would pass restrictions on owning and selling guns. 2013 had 11,445,851 NICS checks in the first half of the year. It is clear that 2017 gun sales were a bubble created by fear of Hillary Clinton. But instead of the bubble bursting, as people thought would happen with a Trump election, gun sales have only slowed down a little. 2016 was the hottest years for gun sales, ever. 2017 is on track to be the 2nd hottest. Stepping back a little from record sales is *not* bad for the firearms industry. The second quarter 2017 NSSF-adjusted National Instant Criminal Background Check System (NICS) figure of 3,116,282 is a decrease of 2.0 percent over the 3,179,825 figure for second quarter 2016. The adjusted NICS data were derived by subtracting out NICS purpose code permit checks and permit rechecks used by several states such as Connecticut, Illinois, and Utah for CCW permit application checks as well as checks on active CCW permit databases. NSSF started subtracting permit rechecks in February 2016. According to the Industry group, the first half of 2017 is within 2% of the all time record for gun sales set in 2016. That is not bad news. Six months that comes within 2 percent of the all time record for sales, is good news. LEXINGTON, S.C. (AP) — Authorities say a man shot to death in the front yard of his South Carolina home appeared to be attacking his neighbor who then fired in self-defense. A woman shot at a prowler who reportedly broke a window of her home and threw a hammer at her Monday night, police said. The intruder, identified only as a black female, was confronted about 11:30 p.m. at a home in the 6900 block of East 18th Street, Sgt. Stephen Florea said. The home's occupant told police she was sitting on her bed when the window was broken. She retrieved a handgun and fired one shot out the window toward the prowler, scaring her off, Florea said. DEKALB COUNTY, Ga. - Police say a homeowner shot and killed a man dressed like a woman after he broke into his home. It happened in Lithonia near Brownsmill Road just after 2 a.m.
Channel 2’s Liz Artz spoke to DeKalb County Police Lt. Lonzy Robertson about the case Monday. "The homeowner gave him a warning. The suspect continued to approach him at which time the homeowner fired one shot," Robertson said. When the Australian government passed its restrictive gun law scheme in 1996, it did not anticipate the technological innovations that would be promoted. New in 2014 - Browning launches the Maral high capacity magazine (10-shots) - Available in caliber 30-06. Check out the video right here ! The WFA1 is another straight pull bolt gun with 10 shot magazines, but it is not available in New South Wales on a class B license. It is Class B compliant in Victoria, Queensland, Tasmania, South Australia and Northwest Territories. It is likely being discriminated against purely on its looks. That is common in the world of guns. 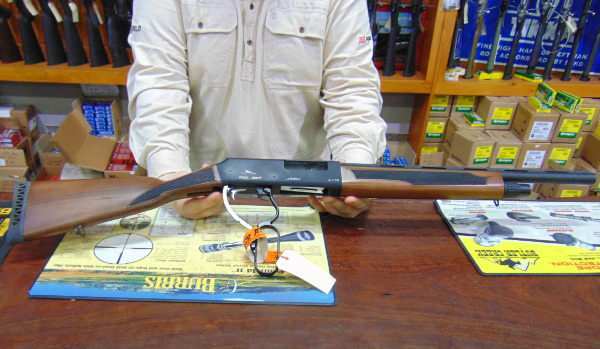 Pump action shotguns require a special license in Australia. Lever action shotguns are regaining popularity. John Moses Browning designed the 1887 Winchester shotgun, which had a five shot capacity. It was improved in 1901, a hundred and 16 years ago. 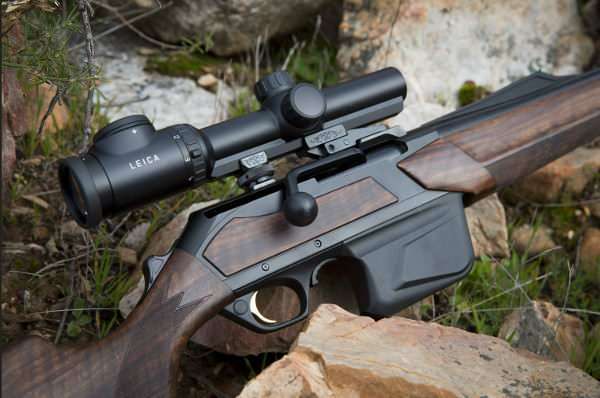 More recently, Winchester had some success with the 9410. Short Stroke Lever (5630 Hardened Steel), 4140 Hardened Steel Inner Mechanism, 4140 Hardened Steel Barrel with Air Cooling Vent Rib, Chrome Lined Barrel and Receiver, 7075 T6 Aluminum Receiver, 3-Screw In Chokes (IM, M, IC; Hardened 4140 Steel), Checkered Turkish Walnut Stock. The Commonwealth currently does not allow Adler A110 shotguns with a magazine capacity of more than five rounds into Australia. The Federal Government has said states and territories must agree on a new classification before it removes the import restriction. The nation's justice ministers could not reach a deal in October, with New South Wales wanting the gun more readily available than other states. An easy way to increase the capacity of a shotgun is to add another barrel. 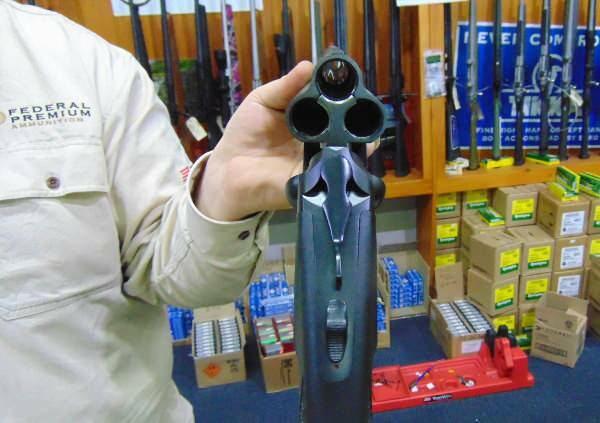 The shotgun is still a break open, simple design, that is available to a Class B license. A class B is the easiest to obtain in Australia. Three barreled combination guns, as drillings, are fairly common in Germany. But straight up 3 barrel shotguns are less so. They are making a comeback in Australia. The Chiappa tripple barrel has one trigger and no selector, so the barrels always fire in the same sequence, right barrel, left barrel, top barrel. I would prefer two triggers and a selector for the top barrel. Maybe the market will produce that option. Australian authorities labeled the shotgun as a "punt gun" which banned it for hunting ducks, one of its most obvious uses. For those Australians with sufficient resources, a custom made triple barrel 20 guage is available from Manton, for about $100,000 AU or more. As it is in 20 gauge, it might not be considered a "punt gun", and thus be suitable for shooting ducks. Some of the overregulation of guns in Australia is being overcome with ingenuity and technological prowess. Guns never were much a problem in Australia, which has had a culturally low crime rate. The gun laws have accomplished little but make life inconvenient for sport shooters and hunters. Some think that was the real purpose. New Zealand did not change its gun laws after the Port Arthur Massacre, and has had similar drops in murder rates to that of Australia. Like Australia, it has not had a mass murder with a firearm since Port Arthur. Australia has had mass murders with other tools, such as knives and arson. I expect over time, Australia will moderate its extreme restrictions. It has some of the best hunting in the world. The rural residents have serious need of firearms for pest control. The Internet revolution is well underway in Australia. The highly concentrated and politically unitary media in Australia will not continue its control over public opinion forever. 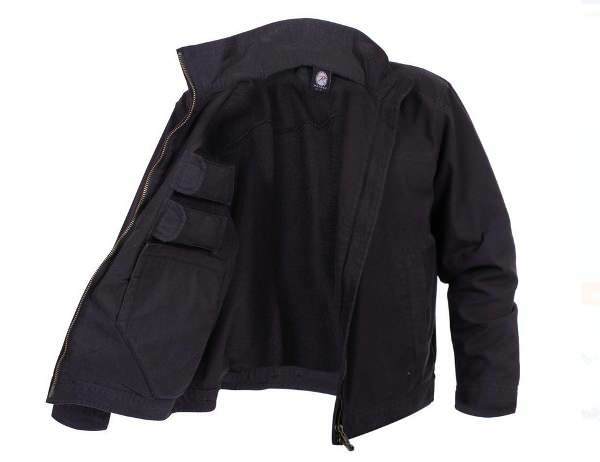 Rothco's Lightweight Concealed Carry Jacket has 2 inner pockets for concealed carry, one on each side, as well as 2 inner mag pockets on each side for ammo. The mirroring pockets on both the left and right, give the jacket a unique ambidextrous feature. The jacket is a product of Rothco, and comes in Coyote Brown as well as black. The price at WalMart is $60-$78. I have not examined the Rothco jacket. But its existence in the WalMart inventory is a powerful statement about the normalization of the exercise of Second Amendment rights. There are 200 million registered voters in the United States. 16.2 million carry permit holders are 8 percent of all registered voters. Virtually all permit holders are eligible to vote. Nearly all of them are registered to vote. If we remove California's 19.4 million registered voters, (only 92,000 permits in the state) and New York's 12.5 million registered voters, (only 88,000 permits in the state), there are 16 million permit holders for 168 million registered voters in the rest of the country. Outside of the highly restrictive California and New York, permit holders are 9.5% of registered voters. I state this with confidence from my experience of teaching concealed carry courses for 15 years. The people who go to the trouble to attend concealed carry courses are among the most responsible people in the community. In fifteen years, I never had a check bounce. People showed up early. They offered to help set up. They are self selected as responsible individuals who anticipate problems and solve them before they happen. President Trump appealed directly to them with his call for national reciprocity. Among permit holders, it seems absurd that their drivers license is universally recognized, but their concealed carry permit is not. Permit holders are a force to be reckoned with in the economy, as well as at the voting booth, as evidenced by WalMart's marketing of a concealed carry jacket. A young woman with a concealed weapons permit and a gun was on the scene at the terrorism-like attack on mourners at Greenlawn Memorial Park and might have prevented further bloodshed. The presence of a gun was confirmed by Jennifer Timmons, a spokeswoman for the Columbia Police Department. YORKVILLE, IL — A party guest shot and killed a dog that attacked a homeowner Friday evening in Yorkville, police said. The dog, a tan and white husky, was running loose in the 600 block of Heustis Street at around 5:30 p.m. Friday when it wandered into a yard where a birthday party was happening, Yorkville Deputy Police Chief Larry Hilt said. According to police, the dog was growling and showing its teeth. When the homeowner attempted to grab the dog's collar, the dog bit him on the forearm, Hilt said. ST. LOUIS COUNTY - An investigation is underway after police say a taxi driver shot and killed a man in self-defense while driving on Interstate 70 early Sunday morning. D.C. requires gun owners to have a “good reason” to obtain a concealed carry permit. The U.S. Court of Appeals for the D.C. Circuit struck down the regulation as too restrictive in a 2-1 decision, The Washington Post reported. “The good-reason law is necessarily a total ban on most D.C. residents’ right to carry a gun in the face of ordinary self-defense needs,” Judge Thomas B. Griffith wrote, according to the paper. From the examples of Peruta in the Ninth Circuit, the Maryland ban on "assault weapons" in the Fourth Circuit, and the 11th Circuit decision to uphold the chilling of Second Amendment rights by doctors as agents of the government, I expect the District of Columbia will ask for an en banc ruling from the entire D.C. appeals court. It seems that any upholding of Second Amendment rights is appealed en banc, which is to say, to the entire court. An en banc appeal may not be granted in D.C. It requires a majority vote of the D.C. non-senior judges. The D.C. Court refused en banc appeals by the D.C. attorney general for two previous Second Amendment cases in recent years. If the court refuses to grant the en banc request, or if the case is heard en banc, and if the D.C. circuit upholds the three judge panel, the case will be appealed to the Supreme Court. Senate Democrats, lead by Harry Reid, used the "nuclear option" to stack the D.C. Court of appeals with President Obama's appointees exactly for such situations as this. The Republicans recently returned the favor by using the "nuclear option" to confirm Supreme Court justice Gorsuch. The Supreme Court has been reluctant to hear Second Amendment cases. 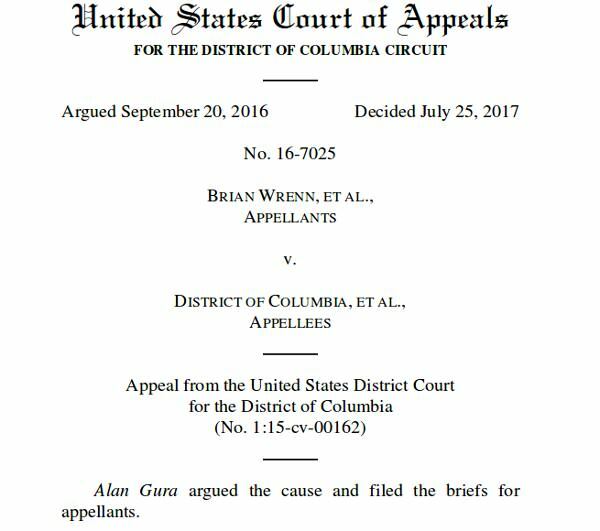 The decision of the three judge panel on the D.C. Court of Appeals has made Wrenn a case that upholds the Second Amendment. Most of the previous cases denied by the Supreme Court upheld infringements on the right to bear arms. The Fourth Circuit Court of Appeals upheld the ban on so called "Assault Weapons" (commonly owned semi-automatic rifles) and on standard capacity magazines that hold over 10 rounds of ammunition. The petitioners in that case, Stephen V. Kolbe v. Lawrence J. Hogan, JR., have decided to appeal the decision to the U.S. Supreme Court. Police say two men broke into the home on Kenoak Lane just after 3 a.m.
That's when 24-year-old Gary Gross grabbed a hammer and confronted the two intruders that he says he's never seen before.After a brief struggle, Gross says he ran outside, grabbed a gun from his car, ran back inside and then shot both men who fled from the house and drove away. The 62-year-old caller said he was at home when he heard noises outside and armed himself with a 12-gauge shotgun as someone continued to try to enter the home. The man told investigators he opened his front door and fired at the teen when the he rushed at him with an object ― later identified as a framing hammer― in a threatening manner. The teen, dressed in dark clothing, ran a short distance before collapsing in the driveway, where he died, investigators say. He was found with a backpack containing a sledgehammer and items from the Community Church at LeJean and Westminster. LAS VEGAS - The Clark County District Attorney will decide if a man will face charges in a late-night shooting death at an apartment complex near the Meadows Mall. Police said it appears the man was trying to protect a woman who was being beaten by her boyfriend. Metro Police detectives said the shooter was not arrested and was cooperating with investigators. JOHNSON COUNTY, Ind. -- A man who was shot multiple times after brandishing a gun during an argument with his neighbor has been charged for his role in the shootout. Jeffrey Weigle, 59 was shot four times in the chest by his neighbor, Dean Keller, last month. Weigle was hospitalized in critical condition. The Johnson County Prosecutor's Office said Keller acted in self-defense and wouldn't be charged. In Australia, there are few limitations on the hunting of non-native species. Rabbits, cats, feral dogs, feral horses, feral donkeys, feral pigs, feral goats, foxes, camels, wild cattle, and water buffalo can be taken with few regulatory limitations. Deer have some limitations on the calibers that may be used. Game can be shot with spotlights and from vehicles. The shooting of kangaroos is regulated as to what position the animal must be in when shot (standing), where the animal may be shot (brain shots only), what calibers may be used (centerfire only, .204 Ruger and up), the range they may be shot at (less than 200 meters), and of course, who may shoot them (licensed commercial shooters and primary producers). Farmers are the most common primary producers. Commercial shooters need to apply for permits and numbered tags. 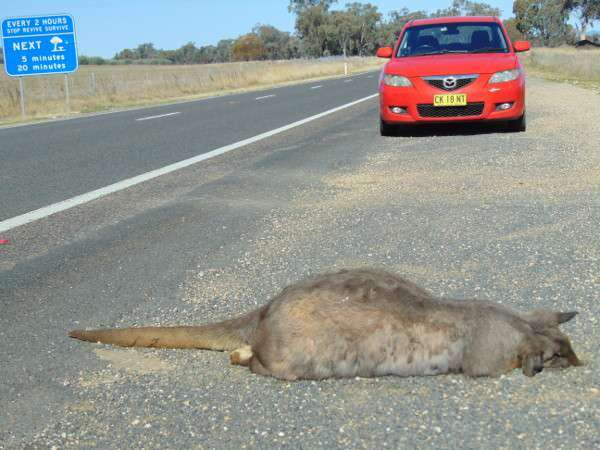 Primary producers need to apply for a permit to shoot kangaroos that are damaging crops. Farmers are granted permission to shoot limited numbers of kangaroos. When the number is reached, they can apply for another permit. Telescopic sights are required for rifles. Semi-automatic rifles may not be used. Some use of shotguns in special circumstances is allowed in South Australia. Rifles are required to be sighted on a non-animated target before each day's or night's hunting. Subsonic ammunition may not be used. The regulations for shooting kangaroos commercially for meat and skins differ a little from shooting non-commercially for damage control and mitigation. There does not appear to be any allowance for shooting kangaroos by sport hunters. In the United States, the regulations for most game vary considerably by state. In Australia, the regulations for kangaroo shooting varies a little bit by state, but is mostly controlled by national codes of practice. The codes of practice were formulated by the Natural Resource Management Council. All states follow the guidelines. The United States has analogous regulation in the Federal requirements for hunting migratory birds. Australians may think the U.S. steel shot limitations and multitudinous rules for hunting waterfowl to be as peculiar as the fine detail in the kangaroos shooting regulation seems to Americans. Australians likely think United States protection of feral horses and burros to be bizarre. Feral horses and burros are introduced species that do significant damage to the native ecology. For most hunting other than for kangaroos, Australia is far less regulated than the United States. The Arizona Department of Transportation has added a section to its drivers manual suggesting the proper behavior for an armed driver, when stopped by police. The change was prompted by the tragic Philando Castile case. From fox10phoenix.com, the manual change was requested by Democratic state Representative Reginald Bolding, from District 27. District 27 is a solidly Democrat stronghold in South Phoenix. Bolding was elected in 2014 and re-elected in 2016.
your person or in the vehicle. Arizona law does not require that people carrying concealed weapons notify police, but it requires that people carrying a concealed deadly weapon answer truthfully if asked by police if they are carrying . If the officer does not ask, a person who is carrying a concealed weapon is not obligated to tell the officer they are armed. If the driver has a concealed carry permit, an alternative is to hand the officer the permit along with the driver's license. Then the officer will be responding to the positive information of "concealed carry permit holder", instead of "armed driver". If you do not have a permit, use a positive phrase. Many officers have been trained to react negatively to the word "gun". Telling the officer that you are "legally armed" is better than saying "I have a gun". The perception of concealed carry permit holders changed considerably in 1999 when permit holder Rory Vertigan captured a cop killer with his legally carried Glock pistol. Police called Vertigan a hero and donated money for him to buy a new Glock while his was impounded as evidence. 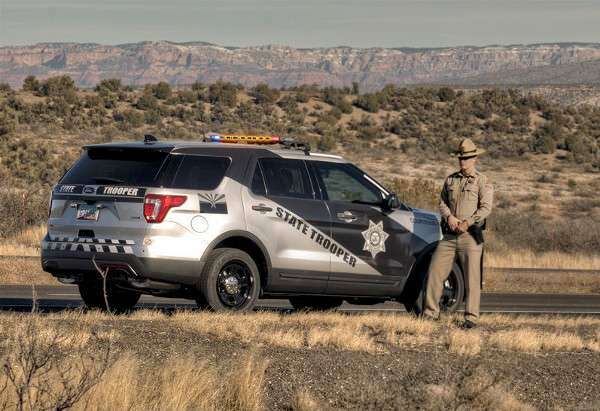 More recently, an armed citizen is credited with saving Arizona State Trooper, Edward Anderson. There are numerous stories of people with concealed carry permits seeing a positive change in police attitudes when the police were informed the person stopped had a permit. The acknowledgment in the DOT drivers manual that many drivers are legally armed is a sign of the normalization of armed citizens. The tragic circumstances of the Philando Castile case will be cited for and against the advisability of notifying officers if you are armed. In some states, the notification is required by law. In others, it is conditional, depending on whether the officer asks or not. In other states, no notification is necessary. Minnestota law is similar to that of Arizona. Castile was not required to notify the officer that he was armed until asked. The shooting of Castile might have been avoided if he had not volunteered that he was armed, or if he had kept his hands on the dash while waiting for the officers instructions. Hill stepped outside his home and confronted the man, later identified as Daniel Cash, according to authorities. Police say Cash had erratic behavior and repeatedly confronted Hill in a hostile manner, despite being asked by Hill to leave his property. Hill shot Cash after Cash advanced toward him, according to authorities. LOUISVILLE, Ky. (WDRB) -- An alleged robber has been arrested months after police say he was shot in the chest by the man he was trying to rob. According to an arrest warrant, it happened on Nov. 22, 2016. Police say a man called them to report that he'd just shot 19-year-old (now 20-year-old) Keith Dawson after Dawson tried to rob him. Police say the victim told them Dawson walked up to him, pulled a handgun and demanded cash. At that point, the victim said, he gave Dawson $200, and Dawson pistol-whipped him. The victim says he then pulled his own handgun and fired several shots at Dawson, hitting him in the chest. The two were going through a divorce. Clinton had been under a protection order that had expired July 11, just four days prior to the shooting. "I’m sad that it happened that way, but it sounds like she protected herself," said neighbor Hilda Tucker. The sheriff’s office said it appears Hamm feared for her life that Sunday night. 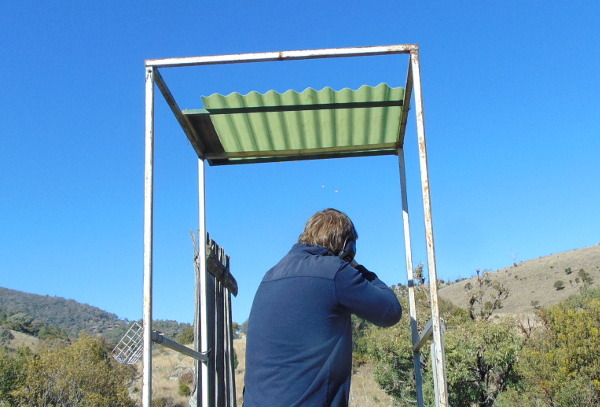 On Sunday morning, July 23, 2017, Roy Eykamp, Jr. invited me to the Quirindi Sporting Clay Target club. The club is located 20 some kilometers out of town on a few acres of a former sheep farm, in New South Wales, Australia. A small creek meanders through the property. A combination of flat land for a club house and parking, with surrounding hills and mixed elevation gives an ideal location to configure challenging sporting clays competitions. I fell in love with the atmosphere and the club from the start. 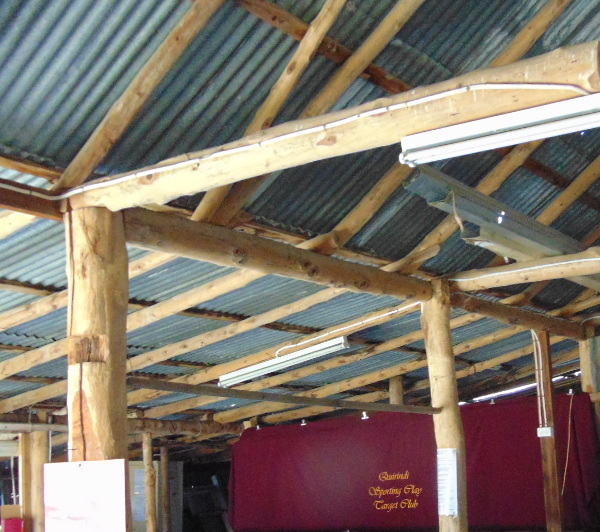 The club house is a former shearing shed. The exterior is sheet metal, the interior a finely crafted wood pole framework constructed by hand with adze and saw, about a hundred years ago. Members of the Club leadership gave me leave to take as many pictures as I wished. There was no hesitation. The club members were friendly, the atmosphere collegial. Everyone was there for a good time, and the feeling was contagious. I instantly felt at home. The gun culture transcends international boundaries. Safety rules were followed scrupulously. I have seen the same at all gun clubs that I visited in America and in my travels. Members of the gun culture are serious about following safety rules. Anyone who is not serious is not a member for very long. This happens without legislation. It is the same in Arizona as it is in New South Wales. It is caused by physics and human nature. Those in the gun culture know how guns work and what they can do. The requirements to prevent accidents transcend politics. People who join gun clubs are invariably some of the most responsible members of society. Several dozen men and women participated in the planned event. The course, as I recall, consisted of six stations, where four clay targets were presented to each participant at four stations, six at one, and three at a rabbit or ferret station to make a total of 25. The targets were highly varied and challenging. It appeared to me an accomplished game shooter would be doing well to hit over half the targets. Small groups of shooters went from one station to the next. I followed Roy Eykamp and his group around the course. Dozens of club members on a Sunday, attending a sporting clays event, would be a good turnout at any comparable town in America. Quirindi has a population of a bit over 3,500. The total in attendance likely exceeded 50. Almost all the shotguns I saw were over/under 12 gauge. I saw one single barrel shotgun. The license requirements for pump and semi-auto shotguns are very restrictive in Australia. To be fair, in America, pump shot guns are almost never seen at sporting clays events. They are legal, easily available, and very popular in America, but the rules of the game favor double barrel guns. In America, semi-autos have a small following for sporting clays. 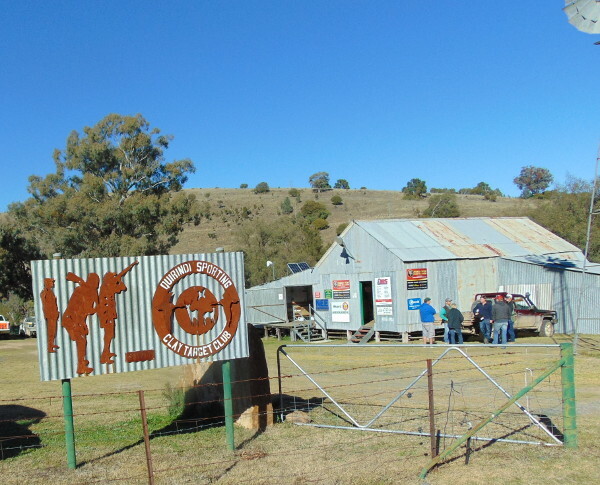 The Quirindi club in Australia allowed for their use, but a special class of license was required. People who registered for the event were required to give their shooting license number. I was asked what I thought of the shooting prowess of the participants. It was exactly what I expected at a local gun club in America. To most shooters, the camaraderie and social interaction are every bit as important as the final score. Shooters at clubs have earned each other's trust. The setting was gorgeous, the participants friendly and polite, the weather perfect, the course challenging. It is hard to imagine a better gun club event. 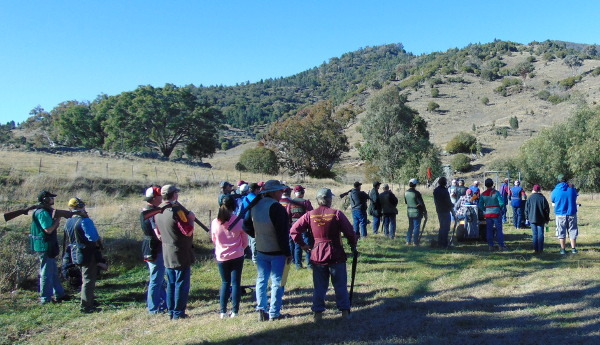 The gun culture is alive and well in rural Australia. The people there have a great deal in common with those in rural America. Just after 8 p.m. Thursday, a car with an unknown number of teens inside began shooting at another vehicle near 900 N. Redwood Road, said Salt Lake police detective Greg Wilking. The other vehicle was occupied by a couple and their teenage son. The attack appeared to be at random, Wilking said. All of the windows of the victim's vehicle were blown out as the teens fired several shotgun blasts, Wilking said. The father being shot at is a concealed weapons permit holder and returned fire with his own gun, shooting the other vehicle multiple times, Wilking said. SARASOTA- Two armed masked men walk inside a Pizza Hut on 17th St. in Sarasota, hoping to rob the place but for one employee becoming a victim wasn’t an option. Just before midnight, 22-year-old Alexsandr Gorislavets faced a life and death situation when 20–year–old Henry Morley and 21–year–old Shawnathan Young pointed a gun at him. Gorislavets fired back with his legal to carry gun because he feared for his life. NASHVILLE, Tenn. (WKRN) – Two men tried to rob an elderly man in Madison, but the victim fought back, pulled out a gun, and shot one of them. The complaint goes on to say Hopkins ordered Deyo to log in to his computer and transfer a domain name to a third party, that's when Deyo grabbed the gun and a struggle began between the two. During the altercation the gun went off shooting Deyo in the foot, according to the complaint, that's when Deyo grabbed the gun and shot Hopkins twice before calling police. LA: Armed Elderly Homeowner Stops Home Invaders, Shoots, Kills one. According to the Zachary Police Department, the shooting occurred in the 4000 block of McHugh Road when a group of people tried to break into an apartment. The suspect, Damon Hayes, Jr., 20, was shot and killed by a homeowner. President Trump promised to protect the Second Amendment and to push for national reciprocity for concealed carry permits. A qualified individual must: (1) be eligible to possess, transport, or receive a firearm under federal law; (2) carry a valid photo identification document; and (3) carry a valid concealed carry permit issued by, or be eligible to carry a concealed firearm in, his or her state of residence. H.R. 38 will allow America's 17 million concealed handgun permit holders to carry in every state in the Union as they go about their lives. As the recent shooting in Alexandria shows, crime and terrorism have no borders. Neither should self-defense! The petition was started on 18 July, 2017, and has over 8,000 signatures so far. It has until 17 August, 2017 to accumulate 100,000 signatures or more. Here is the link to the petition. It requires submission of an email address and personal information to be counted. Congress has already passed such legislation for current and retired police officers. The courts have already enforced that law, known as LEOSA, The Law Enforcement Officer Safety Act. LEOSA has been steadily expanded by amendment and by court interpretation. H.R. 38 would be following established legal precedent. Some people insist that all our Second Amendment rights be restored immediately. They say any partial restoration of rights is no victory at all. 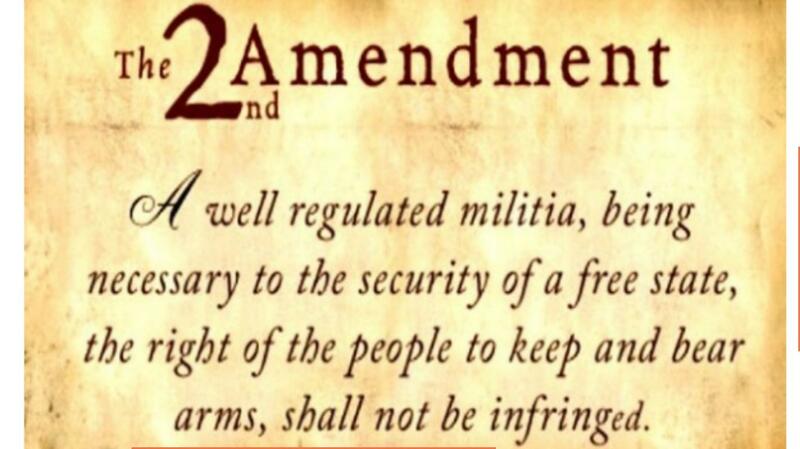 The infringements on Second Amendment rights did not happen all at once. They accumulated over time, starting with restrictions on concealed carry in the 1830's. Incrementally restoring Second Amendment rights has been working. Fourteen states now have close approximations of Constitutional Carry. All states have methods for people to legal concealed carry weapons. The methods include shall issue permits in 41 states. Vermont does not have a permit process because they have always been a Constitutional Carry state. The eight states that egregiously violate the right to bear arms (by allowing permits to be denied at discretion) face the prospect of a Supreme Court decision or a national reciprocity law, either of which will remove many of their infringements on the right to bear arms. Fighting with a petition, a friendly President, and a friendly Congress, is far easier than fighting an unfriendly President commanding a military force with all the resources of the Federal government aligned against you. I have signed the petition. Open carry has always been legal in Wisconsin, but case law from 2003 found that carrying a loaded handgun concealed beneath a seat or in a glove compartment, was carrying concealed. 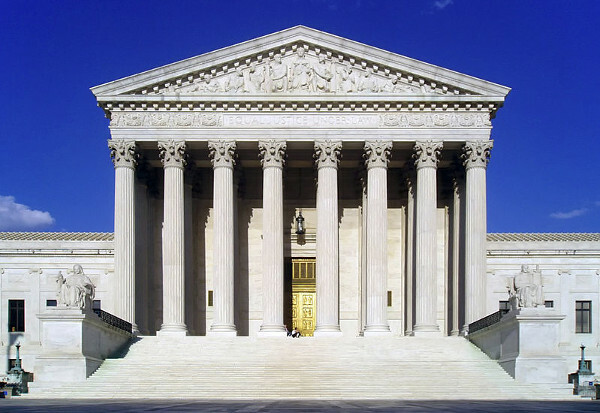 The Supreme Court found the ruling to be correct, in spite of the passage of the strong protection for bearing arms in Wisconsin's Constitution. The Wisconsin Supreme Court has been changed since 2003. Ideological leftists that dominated the court have been voted out. Originalists and textualists have been voted in. Another case on carry in a car, which is carry for security, and other lawful purposes, such as self defense, could have a different outcome. In a recent case on carry on buses, the court ruled that local governments may not ban the carry of weapons on buses. Unfortunately, the defense did not bring up the constitutionality of the city regulation. Several justices appeared to be asking for a reason to consider the constitutionality issue, but the defense refused to raise it. As part of the shall issue law passed in Wisconsin in 2011, the legislature changed the law on carry in vehicles. Carry in vehicles has several exceptions. The issue is whether you can drive with a loaded handgun within reach, even without having a concealed carry permit. Guy A. Smith, a 52-year-old commercial truck driver from Merrill, believes, as does a gun rights organization, that you can. That's why he said he made no effort to hide his revolver when inspectors entered his big rig at a weigh station in Pleasant Prairie in June. Inspectors saw it on the floor of his cab via an overhead camera, then approached Smith and cited him for carrying a concealed weapon, a misdemeanor, and seized his gun. At the time of passage, I thought the change was meant to apply to open carry. Several changes in the law clarified that open carry was legal, was not "disorderly conduct" and was a protected activity. It only made sense that open carry in a vehicle would be protected as well. Concealed carry was allowed for with a concealed carry permit. Edit: Assistant District Attorney Thomas Binger may appeal if he believes the Judge ruled incorrectly or if he believes incorrect procedure was used. Binger has already stated that he chooses not to read the law the way it was written. 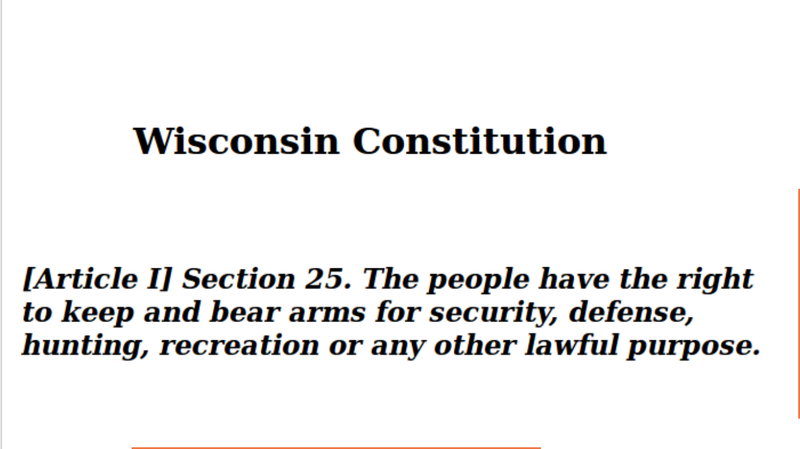 He says that would nullify Wisconsin's concealed carry law, Act 35. The Judge corrected Binger, saying it would only nullify the statute in cars. I expect the jury to find Smith not guilty. If found guilty, I expect the defense to appeal. Wisconsin Carry is funding the case. If the Constitutionality defense is included, the Supreme Court will have a chance to clarify that the Article 1, Section 25 of the Wisconsin Constitution, ratified by 74% of the voters, actually means what it says. Feral pigs in Australia are a serious pest. They destroy habitat and native species, and inflict large amounts of damage on crops. They are a favorite target of local hunters who shoot them as often as they can. 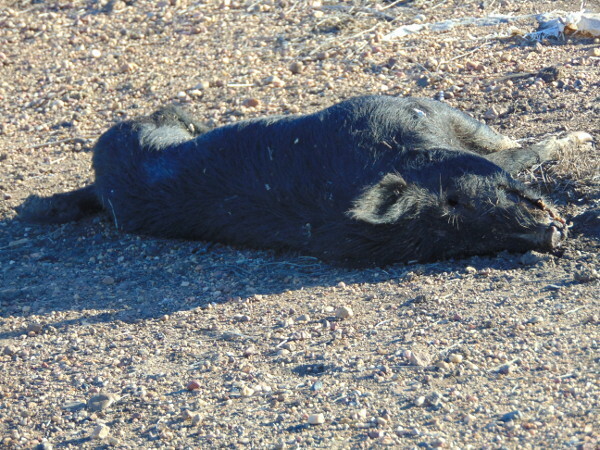 Few people in the area near Quirindi (200 miles NW of Sydney), eat the wild pigs that are shot. I was puzzled by this, as meat prices are high, and the wild pork that I have eaten in California and Texas was excellent. One of the reasons for a lack of consumption is the feral pig population is a reservoir of brucellosis suis, which can be transmitted to dogs and humans. Gunnedah, NSW, is about 50 miles from Quirindi. The veterinarian, Tina Clifton, is urging care by the Gunnedah community following two confirmed cases of Brucellosis in dogs in the area. Brucellosis suis is the variety of Brucellocis found in pigs. The Brucellosis suis (pig brucellocis) is not a threat to the area cattle. There is a feed lot within two miles of where I am writing that produces 55,000 head of cattle a year, with a capacity of 20,000 at a time. Pig hunters use many different methods in NSW. Nothing seems outlawed, but the use of semi-auto firearms requires a special license. My hosts used to hunt wild pigs from a helicopter with semi-auto rifles, shooting as many as 120 a day. Helicopter hunting now requires a special license for both the pilot and the shooter. The farm helicopter was sold years ago. Shooting at night with spotlights is common, as is the use of dogs. Non-firearms license holders can legally shoot pigs if accompanied by a licensed gun owner. Feral pig hunting is the number one risk for catching brucellosis in NSW. Farmers and others who shoot or trap feral pigs are also at high risk of infection. Pig hunting dogs are also at high risk, and can potentially pass on the infection to other dogs and humans. Farm dogs are at risk of brucellosis from wild pigs because they may find and feed on wild pig carcasses. In spite of the risks, cases of brucellosis appear to be rare. The finding of brucellosis in the two dogs mentioned above, was rare enough to make the news. 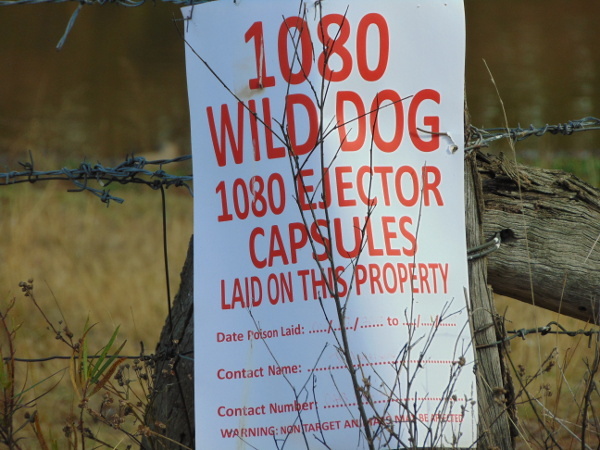 Mr Wishart said feral pigs were appearing in other states where they weren’t before. 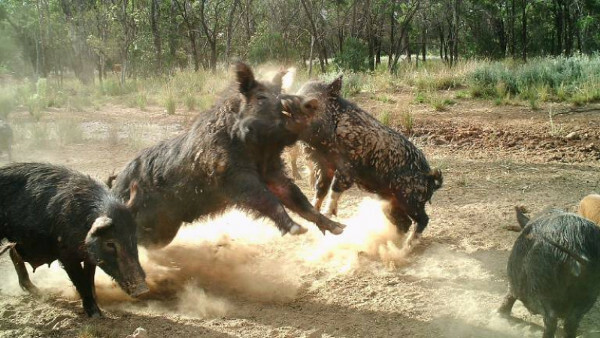 Australian feral pigs are probably the easiest big game to hunt in Australia. They are numerous, and people hunt them at all times of the year. If you can make contact with people organizing a pig hunt, there is a good chance for an invitation. Wade was afraid the huge hog would injure or kill the family pet so he grabbed a .38 caliber revolver that he keeps for home defense and went out on the front porch. "By the time I got in a position to shoot, the hog was about 12 yards away," Wade said. "Cruiser was out of my line to the hog so I fired." It took three shots to take him down. The giant hog hit the ground near the carport. The next day, Wade took the wild hog to Brooks Peanut Company and weighed it on the drive-thru scales. The hog tipped the scales at 820 pounds and had six inch tushes. Kari Thompson with the Kansas City Police Department said the man who was killed was trying to rob a couple as they were unloading their car. "These victims complied, however the suspect became more aggressive and attempted to get them to go into the residence," Thompson said. "At that time, one of the victims got their firearms, fired and fired upon the suspect." Police detained a 17-year-old boy who was shot in the leg late Monday after allegedly trying to break into a home along Clearvue Avenue in Duquesne, according to Allegheny County police Superintendent Coleman McDonough. McDonough said the teenager fled the area in a car after being shot but drove it over an embankment. Police found him at his Commonwealth Avenue home, McDonough said. Excellent essay by Rob Morse. Good job, Rob. Legal gun ownership is heavily regulated in the United States. Protecting our rights is not necessary when we agree. It becomes essential to protect a minority view, and gun owners are a minority here in the US. Pew research conducted a series of interviews last month. They released reports on the opinions of gun owners and non-gun owners. Here are where gun owners and non-owners disagree based on recent polling data. Gun-culture 2.0 is centered around self-defense rather than hunting. That motivation has grown in recent years but there is still a large urban/rural divide in gun ownership and the attitude towards firearms. Most rural households have a gun. Urban households with a gun remain a minority. You’re almost twice as likely to live with a gun in your home if you live in the country as opposed to the city. There are similarities. A majority of gun owners in both settings have a loaded gun easily accessible. “ I jumped out of my truck with my pistol and yelled at the man to get down. He was yelling, ‘ I need help!’ I knew who he was, and I probably used some words you can’t print,” Morgan said. “ I just kept yelling, ‘ Get down on the ground!’” Morgan said he fired a shot into the ground both to scare the fugitive as well as let Warfield and Dulaney know there was trouble. Dulaney, 48, was on the phone with the 911 dispatcher, relaying exactlywhat was happening. Warfield had grabbed his rifle and was sprinting toward Morgan, who had the suspect on the ground. Kimber's parents and boyfriend left for work and after seeing our story. Her boyfriend came across some deputies on his way to work and got more information from them. He then called Kimber to let her know what deputies told him. Kimber then called her dad and asked if she could grab one of his guns for protection. He said yes. Kimber pulled her gun out, pointed at the suspect and said, "Who are you?" and "Get the (expletive) out of my house!" According to Kimber, the intruder's eyes got really wide and he ran out of the house. As he was running from the home, Kimber says she fired one shot into the ground. No mention is made if Councilman Chavez took his firearm with him while pursuening the criminal. If he did, he might have violated California law. Although the church doors were open that morning, there were still worker there preparing for the upcoming week late into the night. "They were getting ready to go on a youth trip and they were working late to get ready for the trip in the morning," said LT. Brian Smith. Many may be wondering why this worker had a handgun on church grounds. "In a church or not wherever you are you have the chance to defend yourself in your home you have certain additional rights," said LT. Brian Smith. The second victim of the robbery fired a single shot into the upper torso of the suspect, who was 26-year-old Steffon Tolver. Two men were sitting on a front porch when an armed man walked up and attempted to rob them, the statement said. Police were not sure if the suspect was hit in the exchange of gunfire. The victim was not seriously hurt, the statement said. Australia has a feral predator problem. Feral dogs and dingo/feral mixtures kill large numbers of lambs and calves. They predate on native species. But as bad as feral dogs and dingo/feral mixes are, the top predator in most places is the feral cat. Exotic foxes, that were imported from England are considered pests. Restrictions on gun ownership and hunting have made the feral predator problem worse. The government could encourage people to carry rifles and shoot feral predators. Instead, the government puts out 1080 ejector capsules. When an animal pulls at the bait, the spring loaded ejector propels the poison capsule into the animals mouth. Death comes quickly. Professional hunters also cull wild dogs. To hunt feral dogs, feral cats, or foxes on public land requires a restricted hunting license in New South Wales. It takes a bit more effort than a general license, but is available to those who take a test and belong to an approved hunting organization. Tom Varney was a legendary wild dog hunter in Australia. 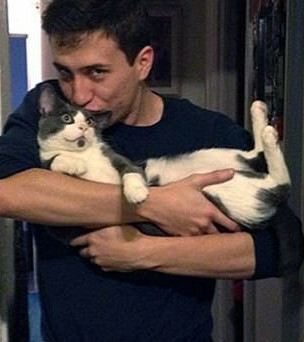 "We are not culling cats for the sake of it, we are not doing so because we hate cats. "We have got to make choices to save animals that we love, and who define us as a nation like the bilby, the warru (Black-footed rock-wallaby) and the night parrot." Members of the Eykamp family told me that local hunters had some success in baiting and shooting feral cats. Feral cats can be tough to eradicate so with a .22 rimfire close in shots are best and shots to the head or neck with high velocity .22 ammo are recommended. I have witnessed the Editor put a .22 LR High Velocity HP into the chest of a feral cat marauding around a warren from 30 metres and it ran away to be unrecoverable. Depending on the size of property for the reason of safety, the .223 and other similar centrefire calibers will do a good humane job on feral cats. Also the fox whistle and predator type callers can help in attracting the feral cat and also glassing around rabbit warrens can be productive in finding them in the first place. “There’s no question there is a selection for bigger cats,” he said. He said other factors such as the animals feral cats eat and their movements probably didn’t have as much of an impact. “I think it’s got to be genetic,” he said. A large feral cat in Gippsland was projected to be 170 cm long, or five and a half feet, long, including 60 cm or two feet, of tail. The record length for a domestic cat was claimed to be 121.9 cm. The head of the Gippsland specimen was destroyed in the accident that killed the animal. Foxes can be a problem for farmers, and are often shot in populated areas. They kill many native animals. 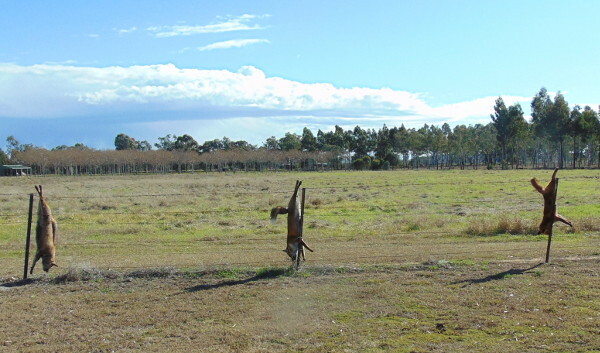 Exotic (non-native) foxes shot by a farmer in NSW, Australia. Feral predators are a large problem in Australia. In America, before 1960, there were bounties placed on animals that caused problems. Encouragement of widespread gun ownership and the hunting of pests can be part of the solution to feral and exotic pests in Australia. DETROIT (WJBK) - A repo man said when he pulled up to repossess a vehicle in Detroit, he had no choice to but to shoot a family's dog that he says was ready to attack. But the owner of the dog says that's not true - from the back of a police car. The person was arguing with the driver and at some point allegedly pulled out an object and broke a window in the truck. The driver of the truck drove off, and the suspect gave chase, still with the object in his hand. RANCHO CUCAMONGA, Calif. (KABC) -- A Rancho Cucamonga homeowner shot and wounded a thief who advanced at him with a knife, the San Bernardino County Sheriff's Department said. RIVERTON — A Riverton homeowner tried several times to get an intruder to stay away before resorting to shooting him, according to a search warrant affidavit filed in 3rd District Court. Police say Bradley got into a fight with a 60-year-old man shortly after 2:00 a.m. Tuesday morning in the 5800 block of Koon Road in North Columbia. During the struggle, police say Bradley pointed a gun at the victim and then punched him in the head while demanding money. The two then struggled over the gun and the victim shot Bradley in the leg twice, according to police. It happened about 10:30 p.m. in the 1200 block of McLemore. Officers arrived to find two people shot. They say an 18-year-old suspect robbed and shot a 24-year-old man. Police say a witness then shot the 18-year-old suspect. The person who shot the suspect is not in custody. FLINT, MI - A pair of teenagers have been identified by Flint police as suspects in a home invasion early Tuesday morning on the city's east side that left a 63-year-old man dead. Officers responded around 5 a.m. on Tuesday, July 11, to the 100 block of South Cumberland Street - off of Longway Boulevard - after a call to 911 in reference to a shooting in the area. The incident started as a home invasion, but it soon turned into shots fired between the male homeowner and two teenage males, ages 17 and 18, police said. The homeowner was confirmed dead at the scene. COLORADO SPRINGS, Colo. (KKTV) - A Colorado Springs man was justified in shooting and killing an acquaintance who had barged into his home and was charging at him as young children were just several feet away, the DA's office announced Tuesday. Oh What Have I Done, by Roy Eykamp, Amazon, paperback 266 pages $25, Kindle $9.99, Kindle text to speech enabled. 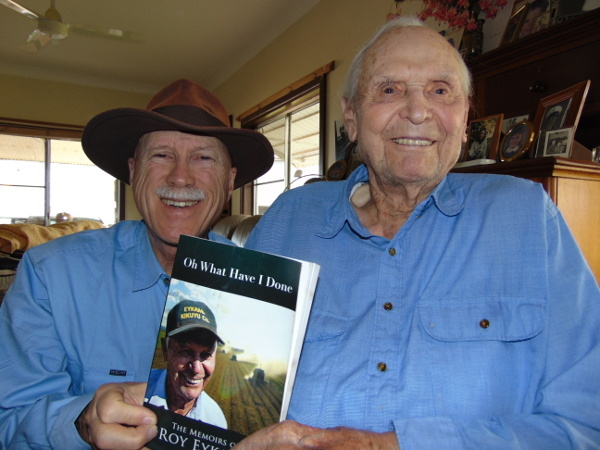 Roy Eykamp is 99 years old. He made his first gun when he was seven years old. It was a crude pistol made from a barrel he salvaged from the trash, fired with a hand held hammer, and later, strong rubber bands cut from inner-tubes and a breechblock. He used it to start his lifelong talent for making money. He shot gophers with it, using .22 shorts. The government paid a 5 cent bounty for each gopher. He made enough money shooting gophers, that when his mother confiscated his homemade gun, he was able to buy a factory one with the proceeds, a Winchester single shot. It was likely a model 67, and cost $5. With the Winchester, he was able to shoot jack rabbits, which had a bounty of 9 cents. A picture of Roy when he was about 16 shows him with upgraded armament. He is holding what appears to be a Springfield 86, a good bolt action .22 with tubular magazine. I carried the sister rifle, model 84-C, with the detachable 5 shot magazine, for most of my youth. Oh What Have I Done is the remarkable story of a life of invention, adventure, and achievement. Roy Eykamp lived through the transformation of farming from horsepower to the giant agricultural machines of today. He was born in 1918, and is clear headed today. His story is one that could be inspirational reading for every high school student. He shows how an innovative thinker and hard worker raised himself and his family by his bootstraps. In the process, he improved agriculture world wide. One of his patents became accepted practice, and is widely used today. His early years show that firearms were integral and accepted tools in America a hundred years ago. Roy became an exceptional shot who always thought outside the box. From shooting pheasants on the fly with a single-shot .22, to hunting Canadian wolves from an airplane, his shooting skills were highly honed and superior to most. I do not recommend attempting to duplicate his feats today. Using .22 shorts like artillery shells to take out geese feeding on corn, out of sight and half a mile away, over a hill, is not something to encourage in today's crowded society. You have to read the story to see if you find it credible. I did. The book is about more than shooting and guns. As you follow Roy's adventures, you learn how a keen eye for detail and a talent for invention lead Roy to successful production. Then an inner voice took him to Australia, in 1963. Roy Eykamp accomplished that feat. He added Kikuyu grass to the useful plants available to Australian and world agriculture. Kikuyu originated in South Africa. Several people had tried to find a way to produce Kikuyu seed in an economical way. All had failed. Roy, ignoring the experts, using his own observations and experiments, succeeded. He was able to find ways to grow Kikuyu and produce marketable seed. The Eykamps market Kikuyu seed all over the world. Kikuyu produces remarkable turf, and superior pasture land. Roy and his family are primary producers who have significantly increased the productivity of world agriculture. Their success has improved the lives of innumerable people. His story is worth the reading. I am privileged to have met him. Oh What Have I Done is available on Kindle and in paperpack at Amazon.com.